I am 58 and wife is 59. We have been married for 35 years. No kids, just a pack of rescue dogs. We live in the Southeast US just outside of a major city. I am in sales and my spouse is accounting/office work. My first job out of school was as an electronics technician at just over $11K/year. I worked my way up to middle management over a 20+ career and a salary of $60K. The company was located here in the SE but was foreign based. Near the end of my career, I felt the company was starting to struggle so I began looking at a career change. I have been with the current sales organization for 18 years. Unfortunately many of our target customers have moved offshore over the past decade or so and my income has dropped rather significantly but I enjoy the team I work with and the customers I call on so I have stuck with it. In addition at nearly 60 years old, stability is sometimes is a good thing as many companies are less inclined to hire someone this late in their career. My wife worked for many years for family owned small companies which did not provide for large salaries or benefits. She has only had access to a 401K for the past 5 years. She is now working for a national company with far better benefits and finally a 401K. We have never been big income earners. That is one reason I wanted to participate in this interview. I wanted others to know that with bull markets and the bear markets, if you start early and stick with it, you can still attain a Millionaire status. I read some of the comments from others stating they just can’t do it because they don’t make enough money. I’m here to say it IS possible! It just takes time and patience. I think my work-life balance is fairly balanced. I do travel for my job, spending 40-50 nights on the road. When I started this career path, we looked at the sales territory, evaluated a good central location so I could travel (almost all by car) and get home most nights. This has helped tremendously with the work-life balance. Other than my career, I enjoy the outdoors and yard work so I also work handyman jobs and lawn maintenance for a few neighbors. Again, nothing sophisticated but adds a couple grand in income that is used specifically to add to the Roth IRA’s and maintenance of the yard equipment. Our annual spending is estimated to be around $50K. We do not live in an extravagant house, purchased 18 years ago for $139K, now worth about $175K. Two cars, one 18 years old purchased new, one just purchased new to replace a 15 year old daily driver that was also purchased new. We also have an RV which is how we spend our vacation time. By traveling with the RV, we do not have the cost of boarding for our dogs. 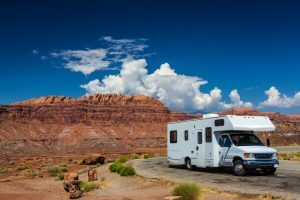 The RV has been able to be written off as a 2nd home (I think the 2018 tax laws may change that) so even with payments, it works for us. We also own a 10 year old motorcycle that was purchased used and paid for in cash. The balance of our expenses goes towards food, clothing etc. From my early 20’s, I began investing through my 401K. I started out with 6% to capture the companies match. Since I was single at the time, every pay raise went straight to boosting 401K until I maxed it out at 15%. When my wife and I got married, she worked for small family owned companies and did not have access to 401K plans so I kept investing everything I could into our retirement plan and eventually started a Roth IRA as well. About 10 years ago, I finally convinced the company my wife was working with to take an extra payroll deduction and monthly electronically deposit it into a Roth I created for her. Finally we were both moving forward in investing! Five years ago, she was forced into the job market due to a layoff. After a year of job searching while the unemployment rate was sky high, she landed her current job for a company with a national footprint. (During her layoff I still contributed the max to my 401K, we just cut back on other expenses) The new job finally offers a 401K and she is contributing 12% to that. Our total percentage is 27% to our 401K’s plus an additional 3%+ to Roth IRA’s. In addition, I have a Scottrade account that I play with on some individual stocks. I use what I call “found money”. This is dividend checks that do not get automatically reinvested, birthday money, rebates, etc. Even if I buy something and have a change of heart and return it, I take the money, since I was willing to part with it at one point, and it now becomes found money and gets slated for the Roth or the Scottrade account. We love to travel with our RV. The US has so many beautiful and interesting places to see. When we finally decide to stop the full time careers, we plan to travel the country. For now, we continue the grind and invest incrementally until we decide we have had enough. I would say I am moderate to slightly aggressive. I did move some cash into some stock that I have been watching and picked up a good sale price on them on the day of the correction. My best individual stock investment was to buy some shares of Bank of America (BAC) back during the financial crisis. I bought in 3 times at 5.80, 6.75 and 7.22 per share. It is currently trading around $31/share. My worst investment was not so much an investment but a poor decision to borrow against my 401K back years ago. I understood I was borrowing from myself and paying myself back but it never occurred to me the impact of the missed compounding of interest. Worse yet, today, I don’t even know why I borrowed the money. Overall it has averaged a little over 8% which has been helped out by the recent bull markets. In my early years as I was learning about investing, I failed to look closely at expenses and carried some mutual funds that were very expensive. Now, my most expensive mutual funds are around 0.7% with some being under 0.5%. I also played VERY aggressively early on which on the run up is nice but brings back reality when the markets take a turn for the worst. At 59 years old, we maintain a 60% stock, 40% bond mix these days. I have an Excel spread sheet that I track nearly daily. If the markets are down, I want to know so I can look for some “found money” to invest. If the markets are down for an extended time and I am getting nervous, I will stop tracking for a while to keep me from making irrational decisions. We have never been exceptionally high wage earners so it has been the slow, consistent investments in our 401K. We are proof that by living below you means and methodically and intentionally moving forward you can become a millionaire. We don’t feel like millionaires, and we don’t live like millionaires. The secret is just to stick with it. Invest what you can, when you can, increase your contributions a little at a time until you max them out so you don’t feel the pain all at once. We do buy new cars but drive them 15-20 years or more if they will still keep going. That makes the new car feel that much nicer. Oh, and we don’t buy fancy cars. A pickup truck with a low level trim package and the new car for the spouse was a $20K Hyundai. Nice car but it does not break the bank. We don’t live in the best house on the block either. It is just enough for us and we don’t have to impress anyone. We have had “life” hit us a few times, made some bad decisions etc and ran up credit card debt. We are still working our way out of it but nearly ready to see the light. THAT will be a great feeling. Today we continue to invest through our workplace 401K plans, invest what we can into our Roth IRA’s and play with a little side cash from time to time in my Scottrade account. Basically, just working the plan! Not formally. It has been a moving target all along. Early on it was to hit $500K, then $1M. As of today, my next target is $2M. By maintaining lifestyle, if we don’t hit it, I’m OK, but I believe you should always shoot for something higher to keep you motivated. I was 58 so we haven’t been there too long but since it never felt any different, we haven’t change our lifestyle. All it has done is make me feel much better about where I stand in preparing for retirement vs the average Joe. We won’t be able to spend at will, but we should be able to maintain the current lifestyle. 1. Have an emergency fund so “life” doesn’t slap you in the face and you run up excessive credit card debt. 2. Retirement accounts are for retirement. Do not use them as a bank. Do not borrow from them! 3. Do not live above your means. Nobody cares if you keep up with the Jones’. For those of us who are not high wage earners, it is a process. It takes time. The real fun begins after years of saving and investing when you can see market swings make big gains (and losses). Invest/save deliberately…every pay check. Look for places to make a few extra dollars and save that too! Small contributions over the year add up! We are not planning to retire early. I like what I do and frankly can’t see myself retiring to a rocking chair. My idea of retirement looks more like finding something where I can work at my pace so I can travel etc. I will continue to be active whether it be a “job” or volunteer. My spouse does want to retire but her plan is at 65 or 66. Other than travel for the early years, the book is wide open. It just needs to be engaging and fun. Health care is always a concern. I am currently looking at long term care costs and coverage. If anyone has suggestions, I’m willing to listen! My parents instilled the basics of saving. From there it was books, blogs, and the internet spurred me on as I began to see my 401K balances grow. I’m not sure I have anyone in particular. I love to listen to Zig Ziggler audio tapes as I travel. I am always intrigued by Warren Buffet and there are so many bloggers that have very interesting reads. We do give to charity but are quite select. We do not look at it from a percentage. It is more a feels right at the time. Some of it is in donations and some is in time. I have some specific charities for cancer, suicide prevention and Alzheimer’s that have affected family and friends that are close to our hearts. We don’t have children so I am not particularly concerned about inheritance but I do want to leave some type of legacy. We have not decided how that will play out yet. Excellent interview! I like hearing from folks that earn modestly but still show that E-S-I will work. Living below your means, investing, and time. Great interview to show that you don’t need an abnormal salary to make a million by 60. Warren Buffet has many interesting interviews on life and his philosophy, along with his business partner Charlie Munger, both of those guys are people I love to listen to as well! Good points here – especially on finding a balance between work and life. I appreciated the detail you provided like selecting a location in your sales territory to enable you to get home most of the time. Great interview and I also love that it came from someone whose family makes an average salary. This is very inspiring, I can’t wait to reach millionaire status, even if it’s just a personal accomplishment to feel proud of. Congrats on achieving the double comma club with steady progress and sensible living on a modest income. It’s great both you and your wife enjoy the work you do. That makes such a difference. I like to hear from a millionaire who made it the “old-fashioned” way… lots of patience and staying the course on a salary that is within the reach of most. Congratulations on your success so far. I think by the time you guys retire, you will have plenty of choices, and options on how to travel and where to travel. This really is the old fashion grind, noble way to prove consistency pays off. I’m loving the variety. What kind of legacy are you thinking in your head? Is it close family/nieces and nephews kind of thought or I want a park named after me kind of thing. You and your wife are strong “living leaders” and as you’ve clearly shared, mistakes will be made. But all can be conquered with a little time and patience and a plan. Your story is much like our story. So glad you decided to share. I backed out on sending mine in months ago. Prob one of the best one I’ve read because they aren’t high earners but still were able to invest and achieve a high amount. Great! Regarding the healthcare costs, I know some choose to move to foreign country to save tons of money. Or invest in health trainer to make sure you stay fit for as long as we can. If anyone got better ideas, can chime in. I know for sure, health care costs will hit most of us in the future as it has become an business empire now. The real care cost in retirement is dental care. Ridiculously expensive ! A person could buy a hugh high-end flat screen TV for the cost of a crown. Even noderately complicated procedures like a bridge can easily cost $5,000. Insurance is not really any help. I’m a firm believer that the USA is still the best place to be regardless of the current political turmoil. The personal trainer may be something to think about! The best part is your intent to show the ‘not so high’ earners that its possible to hit 1M or more with patience and continuing to invest irrespective of market cycles. It was so casual and inspiring to read this interview. Take away : Consistency, its all it takes to hit your goal! Thanks Vishway. We don’t feel we have done anything special. Just worked the plan of a full career. Another great interview. And you MI52 prove that it can be done. The truth is that the tortoise does beat the hare. Wonderful job!!! Another great millionaire interview. You have worked hard and are set up nicely for retirement. Your story is motivating for everyone who is working to build wealth and retire with a nice nest egg. I agree with everyone else. Great story and terrific example from a couple with modest incomes working a plan and having the patience to allow time and compounding to work in their favor. Realistic goals and realistic dreams also contribute to this couple’s success. Congrats MI 52 and welcome to the club! Great job #52! Hopefully this will help quiet the vocal many who say you have to have a six figure salary to do it! Well done – nice achievement! Really nice to show that you don’t need a six-figure income and an MBA to sock away the money! Good old-fashioned patience and persistence can get you there just the same. Love this! For all the reasons mentioned about but it’s just practical advice and shows anyone can achieve what seems to be large goal by being slow and steady. It’s great to see that not everyone makes six figures and really enjoyed reading this. This couple’s journey to a point of financial independence was greatly aided by their choice to go modest on the two biggest expenses faced by americans – housing and transportation. Many more americans with similar incomes could be millionaires by late 50s if they didnt spend so much on housing and depreciating sheet metal. And no kids really helps hold down expenses! I like seeing how people on a middle-class income can still achieve being millionaires, especially in today’s society. With rising housing and living costs, these two have seemed to do fairly well (and a lot sooner than most.). I agree that not having kids may have paid a part, but it’s very slight. I know plenty of people who raise kids frugally and are still able to put away a good sized nest egg. It’s all about compromise and knowing what you’re doing for your future. So great to have confirmation that slow and steady works. Being in similar household income range it is encouraging.